"A Natural History of Uncommon Birds, and of Some other rare and Undescribed animals, Quadrupedes, Reptiles, Fishes, Insects, &c. In four Parts." 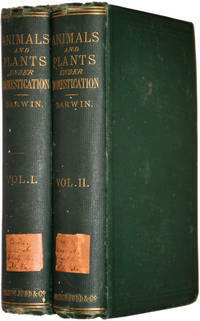 and "Gleanings of Natural History, in three parts"
A very good copy of the text to this important book. No plates included except the portrait of the author and one uncolored plate of a Samoan. Marginal page repair on leaf 53/54 and plate I (very minor, see photos). Foxing on endpapers with a few spots on the titlepage and first two pages. A Very Good copy. Herpetology Mexicana was the earliest significant post-Linnean treatise on the lizards and crocodilians of Mexico. The first 21 pages of the book details Wiegmann's system of classification of the "Sauri,"– Lizards and Crocodiles. 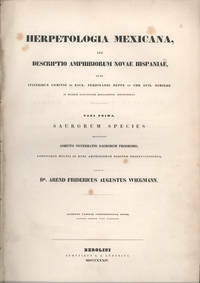 This section was initially published earlier in 1834 under the title "Systematis Saurorum Prodromus, e specimens herpetologiae Mexicanae primo seorsim editus." The second part of the book consists of Weigmann's taxonomic treatment of the lizards and crocodiles of Mexico. Included are the descriptions of 32 new species of lizards, some of which had been briefly described earlier in Oken's Isis. Descriptions of seven new genera are also given, including Heloderma. All of the descriptions are based on specimens collected by Ferdinand Deppe and Count von Sack in the 1820s. In 1969 the Society for the Study of Amphibians and Reptiles reprinted this work in a smaller format with black and white plates and an introduction by Edward H. Taylor — from which the information above can be found along with additional information about the collection and Wiegmann. This book is one of the most difficult herpetological books to be found today with very few copies coming on the retail market in the last 60 years. In addition to it's scarcity, This large folio (12.5' x 18.75' or 31.75 cm x 47.5 cm) book is especially appealing because of its taxonomic importance and the ten beautifully hand-colored lithograph plates. x, 462 pages. Ex-Lib with Hill Library Saint Paul on the title page. Binding shows some wear and between some signatures is loose, so the book lays flat. No indication of thousand (print number) or errata slip, agrees with Freeman 1217, first edition. viii, 144, 7 hand-colored plates. Facsimile reprint with hand-colored plates. Limited to 100 signed & numbered copies. This is number 14/100. This special facsimile has been painstakingly produced to equal the original in quality and presentation. Each of the seven plates have been individually hand-colored by Lara Carroll. 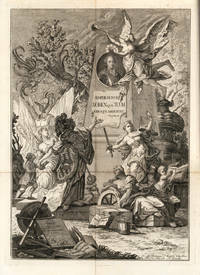 Plate seven was also printed by hand lithography. The entire book is printed on 100% cotton, mould-made paper imported from England.In 1832, Prince Maximilian and his artist, Carl Bodmer embarked on an expedition through North America to compare the Indians and natural history to those of South America which the prince had explored earlier. Their Journey would take them deep into the interior of North America, to Fort McKenzie, near present-day Great Falls, Montana. After returning to Europe in 1834, Prince Maxmilian spent the rest of his life studying his collections. This book is his major contribution to North American herpetology and is illustrated with seven beautifully handcolored plates of turtles and salamanders by Carl Bodmer. xxviii, 70 p., (2), 26 plates (plus 36 plates from the Ophiologie volume). Plates are: Amphibians 7 plates; Turtles 6 plates; Lizards & Crocodilians 13 plates; Snakes 36 plates. "The Encyclopédie Methodique is a modified version of Diderot and d'Alembert's great encyclopedia. It comprises 196 volumes, issued between 1782 and 1832. Herpetological matters are dealt with by Dauberton and by Bonnaterre." 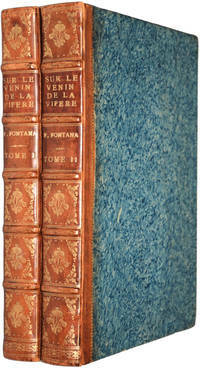 (Vanzolini)The two herpetology sections by Bonnaterre rely heavily on Lacepède, which is openly copied in parts. This work is a good example of late eighteenth century popular natural history. The engravings are generally copied from other works, but still hold some interest today. Being printed before pulp was used to make paper, the archival quality of this book is excellent and it remains in very good condition today.